Sequim bluffs run for miles along the beaches, and many homes have been built on low, medium, and high bluffs over the past half century. I’ve written extensively about Sequim bluffs and bluff stability in prior articles [Sequim Bluffs]. 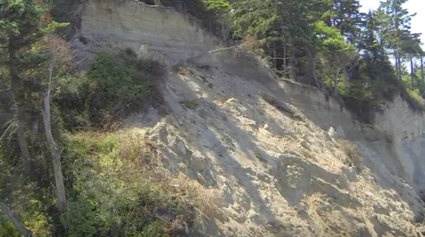 I also produced a video that shows you some major sloughing of Sequim bluffs and explains the issues of concern [Bluff Stability]. There is a home close to the edge at the top of this bluff (not visible). Many of my buyers retiring to the Sequim area express their concern about the “big one,” especially those looking at property along a bluff. Living on the west coast anywhere raises the question about when the next big earthquake will happen. But even as I write this, there was a recent earthquake in Oklahoma and one in Kentucky. If we do have the big one on this side of the country, I suspect we’re all in trouble on the West Coast, not just those of us living on the Olympic Peninsula. The default answer is “no.” But this requires an explanation. You would be covered if an earthquake damaged or destroyed your home on an unstable bluff, provided you purchased the additional earthquake coverage. That coverage is relatively inexpensive, about $200 per year. But if a home is damaged or totally destroyed on a bluff for reasons other than an earthquake (rain and storms and sloughing), you would not be covered unless you paid for very expensive additional coverage, and few people do that because of the cost. In either case, if your home is condemned, damaged, or totally destroyed, you may be responsible yourself for demolition and removal of the home, whether it is at the top of the bluff, halfway down, or on the beach. Looking at real estate on Sequim bluffs requires some serious due diligence and careful consideration. As I’ve studied Sequim bluffs, I’ve come to the conclusion that there are many homes that are precariously perched on unstable bluffs, and unfortunately, the majority of these homeowners are probably not covered by full earthquake and bluff stability insurance. Having said all of this, there are many areas where the bluffs are very stable, and the water views are just stunning, and I have many very happy clients living the retirement of their dreams high up on one of our Sequim bluffs.